Paniguaq (Peter Jacobs, far right) at fish camp, enjoying tepet (fermented fish heads) with Joseph Jenkins and friend. Frank Andrew said: "They never went without a supply of those stinky ones. They say those are more delicious and satisfying than all other fish." Tua-i piyugngallemteni imumi, kiagmi-llu waten uani neqsurluteng ayalartut unuakumi ul'aqan. Tekicata-llu piyugngauralriit tamarmeng, ilakellriit, irniani-llu yuum wani piyugngarilriit, tua-i atrarluta cenamun ciuniurluki, taukut egmianun caliaqluki. Piyugngarilriit tuaten erurivkarluki. Qaqisviitnun-llu tamakut caliaqaqluki irniamtenek ikayirluta. When we were able back in those days, also in the summer down below, they'd go out and fish when the tide came in. Then when they arrived, the whole family, including children old enough to work, would go to the beach and welcome them, and we'd immediately work on the fish they caught. We'd let those children who were able wash the fish, too. With our children's help, we'd work on fish until they were all done. Up'nerkami taryaqviit, cangqarraarqata taryaqvagnek, tagutaqateki, imkunek qanganaruanek-llu iqmiliqernaurai cangtat tamakut. Allaniluki-gguq. In spring the king salmon, when fishermen caught the first salmon, when they brought them up, [my mother] would put a wormwood plant inside each salmon's mouth. They'd say she was giving them food to welcome them. The return of fish was synonymous with an abundance of food. 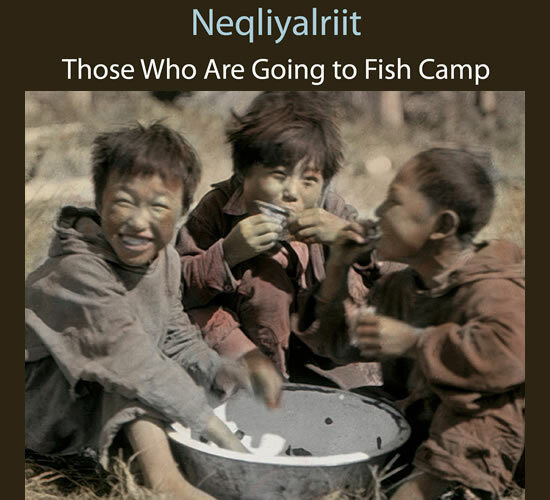 In Yup'ik the word for fish, neqa, is also the word for food. Those living along the Yukon and Kuskokwim rivers depended on the summer fishing season to sustain them, putting away thousands of pounds of fish for use throughout winter. Men rose early and worked late at night, to take advantage of morning and evening tides. Women and children were equally busy--cleaning, cutting, hanging, and smoking the fish.